Is your credit card rewards program worth it? A BIG Four credit card holder will get just $12 of value out of their rewards program if they spend $24,000 in a year, with many customers unlikely to be getting enough bang for their buck to justify the annual fee. 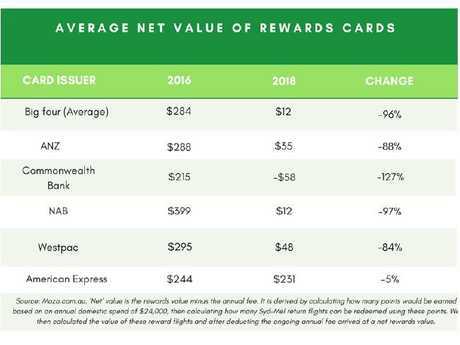 New analysis by financial comparison website Mozo shows the average net value of rewards credit cards offered by the major banks has nearly evaporated in the space of two years, plunging 96 per cent following the Reserve Bank's interchange fee regulation. In 2016, a customer spending $24,000 a year would receive an average of $284 in rewards. To receive the same value from their card today, they would need to spend $60,000. "If you spend less than that the figure's going to be worse, if you spend more it's not going to be so bad, so it really depends," Mozo product data manager Peter Marshall said. "The main point is it's more important than ever for people to know what value they're getting out of their rewards versus how much they're paying to keep that card, and reassess whether they're getting the benefits that justify it." Of the Big Four, Commonwealth Bank fared by far the worst, with a customer on the typical spend now actually $58 in the red under the changes - a decline in net value of 127 per cent. Westpac customers got off lightest with a net value of $48, down 84 per cent. 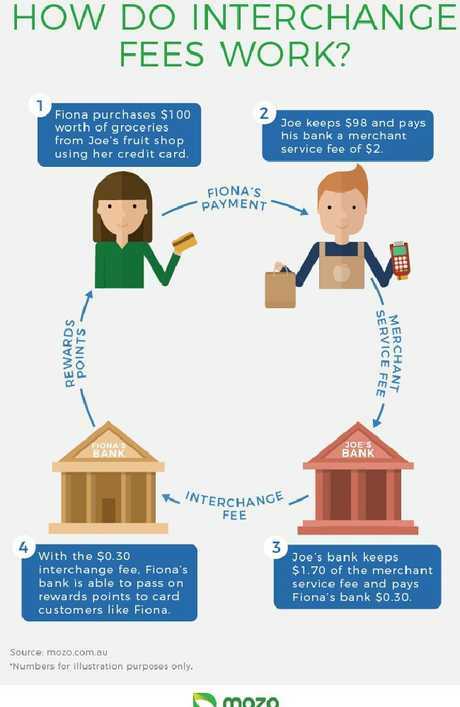 Mozo's analysis was calculated based on the typical credit card spend of $2000 a month, per RBA data, with introductory bonus points and annual fee waiver offers excluded. Net value is the rewards value minus the annual fee. It was derived by calculating how many points could be earned based on the typical spend, then calculating how many Sydney to Melbourne return flights could be redeemed. Last year, the RBA introduced changes that drastically reduced the fees banks could charge each other to process credit card transactions. Those fees were used to fund credit card rewards programs. As the money dried up, the rewards programs withered. "It was basically a nice profit margin that was built into the system for them," Mr Marshall said. "That's been capped so it's reduced the income stream. We've seen a range of responses to that - there's reduced points earning, lower caps on how much you can earn, but also higher annual fees on some cards." The Reserve Bank has capped interchange fees. One of the biggest changes was virtually all banks walking away from issuing American Express companion cards, because the lower interchange fees meant there was effectively no value in them for the banks. Westpac subsequently reintroduced them - which is why it was the best performer out of the Big Four - while Commonwealth Bank opted to keep its companion card open until November 2018, but slashed the earn rate. 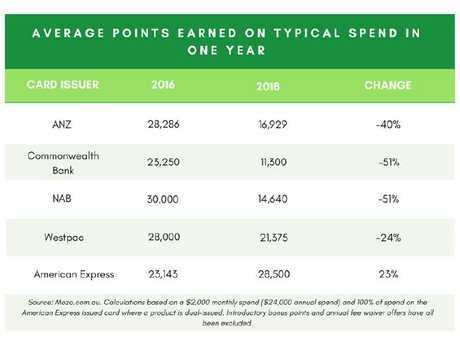 Largely as a result of the companion cards being axed, the amount of points a Big Four rewards credit card holder can earn in a year on a typical annual spend has plummeted by up to 51 per cent, according to Mozo's analysis. Stand-alone American Express card holders, by contrast, have actually been left better off, earning 23 per cent more points in a year based on the typical annual spend. American Express was not affected by the changes because it is both the card issuer and the merchant. In other words, retailers sign an agreement directly with American Express to process their transactions with an added surcharge. It's that surcharge, rather than the interchange fees, that funds the American Express program. "Our results are a huge wake-up call for cardholders to start questioning whether their rewards card is worth it after all," Mozo director Kirsty Lamont said in a statement. "They are now having to spend two-and-a-half times more to earn the same amount of net rewards value they would have received two years ago on the typical annual spend. No longer a card exclusively for big spenders, [American Express] cards generally offer better value for the typical spender." A Commonwealth Bank spokesman said: "We know our Awards cardholders value the benefits available on our MasterCard, Visa and American Express cards. "[Benefits include] comprehensive personalised international travel insurance at no extra cost (for Gold, Platinum and Diamond cardholders) in addition to redeeming their points exclusively in-store at Myer and Flight Centre, alongside many other redemption options, such as cash back, gift cards, merchandise and frequent flyer points. "Our CommBank American Express cardholders continue to enjoy additional points earn and, for Platinum and Diamond cardholders, no international transaction fees on their American Express transactions as well as complimentary lounge passes for our Diamond cardholders until October 31, 2018. We are committed to continuously looking for opportunities to deliver value to our cardholders." A Westpac spokeswoman said: "With the introduction of the Westpac Lite card last year, we offer a range of personal credit cards that cover a variety of individual needs, from our low-interest and low annual fee cards right through to premium rewards cards. "Our partnership with American Express makes us the clear leader in rewards credit cards among the top four. The annual fee attached to our premium cards also covers airport lounge passes, comprehensive overseas travel insurance, accelerated rewards earning capacity, and some other premium benefits such as Amex rewards and pre-sale ticket offers. "Through the Amex partnership, we've been to create card bundle offers to new Altitude customers which hopefully help them to boost their reward points balance." 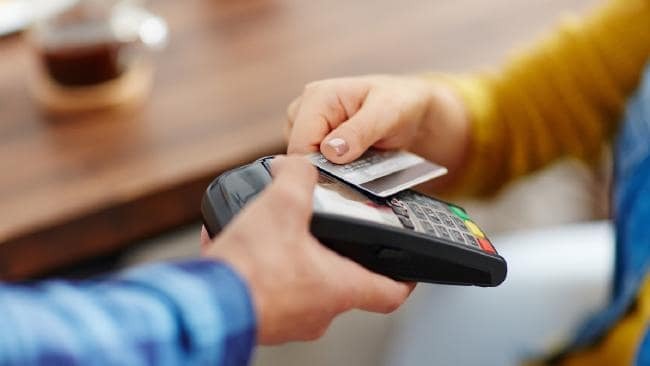 A NAB spokeswoman said: "We offer customers a wide range of credit card products to choose from - cards with no frills, a low interest rate or a low fee, or cards where customers can earn NAB Rewards points or Qantas Frequent Flyer points. 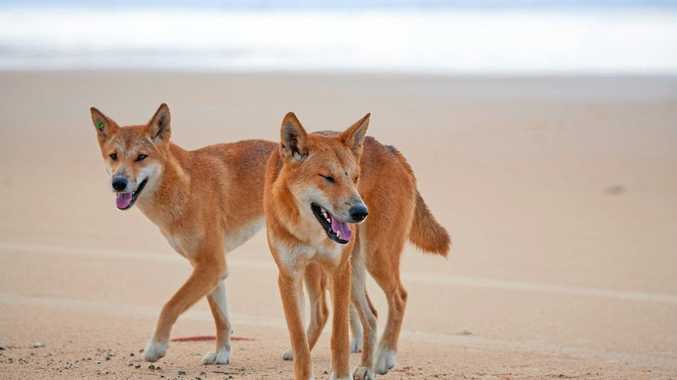 "For example, on our NAB Rewards credit cards, customers can earn up to the value of three points for every dollar spent. "The RBA last year made changes to regulations which impacted credit card schemes and credit card issuers. In making changes to our rewards programs, we carefully considered our customers' needs, and ensured that we continue to offer attractive credit card products in a competitive market." ANZ did not respond to requests for comment.